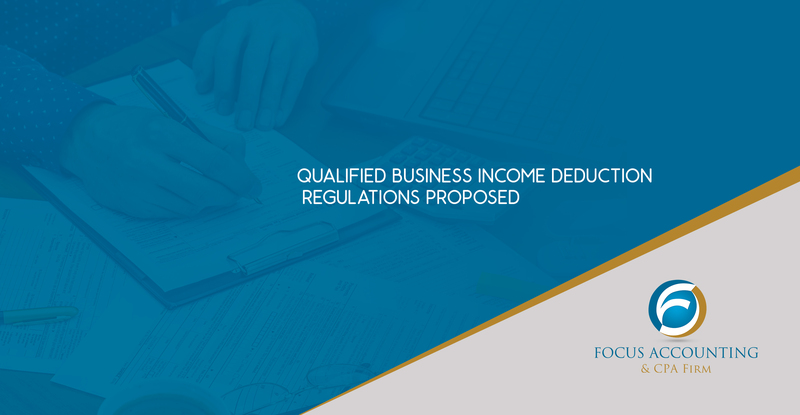 The Internal Revenue Service on Wednesday issued proposed regulations on qualified business income deduction under Section 199A, which was created by the Tax Cuts and Jobs Act. These proposed regulations will affect individuals, partnerships, S corporations, trusts, and estates engaged in domestic trades or businesses, and contain an anti-avoidance rule under Section 643 of the Code to treat multiple trusts as a single trust in certain cases. The IRS also issued Notice 2018-64, which provides guidance on how to compute W-2 wages for purposes of the deduction, along with FAQs. The deduction is generally available to taxpayers whose 2018 taxable incomes fall below $315,000 for joint returns and $157,500 for other taxpayers. The deduction is generally equal to the lesser of 20% of the taxpayer’s QBI plus 20% of the taxpayer’s qualified real estate investment trust (REIT) dividends and qualified publicly traded partnership (PTP) income, or 20% of taxable income minus net capital gains. Deductions for taxpayers above the $157,500/$315,000 thresholds may be limited and the application of those limits are described in the proposed regulations. The IRS is requesting comments on all of the proposed rules, which must be received within 45 days of the date they are published in the Federal Register. The regulations address a variety of subjects. Prop. Regs. Sec. 1.199A-1: It contains the operational rules, including how to determine the deduction for taxpayers with incomes at or below the threshold amounts and for those with incomes above the thresholds. It also contains definitions of the following terms: aggregated trade or business, applicable percentage, phase-in range, qualified business income, QBI component, qualified PTP income, qualified REIT dividends, reduction amount, relevant pass-through entity (RPE), specified service trade or business (SSTB), threshold amount, total QBI amount, unadjusted basis immediately after acquisition (UBIA) of qualified property, and W-2 wages. Prop. Regs. Sec. 1.199A-2: It contains rules for determining W-2 wages and the UBIA of qualified property – both are components in calculating limitations on the deduction. The rules for determining W-2 wages are based on the rules under the repealed Sec. 199 deduction for qualified domestic production activities, except, unlike Sec. 199, the Sec. 199A W-2 wages are determined separately for each trade or business. Prop. Regs. Sec. 1.199A-3: It restates the definitions in Sec. 199A(c) and provides additional guidance on the determination of QBI, qualified REIT dividends, and qualified PTP income. Prop. Regs. Sec. 1.199A-4: The regulations impose a duty of consistency that requires that once multiple trades or businesses are aggregated into a single aggregated trade or business under Sec. 199A, taxpayers must consistently report the aggregated group in subsequent tax years. The IRS rejected comments suggesting the application of the grouping rules under Sec. 469, the passive loss provision, and instead proposed a flexible method that looks into common ownership, shared services, and other commonality, but specifically excludes SSTBs from being aggregated under the rules. Aggregation was one of the AICPA’s recommendations in a letter it sent to the IRS in February and allows for ease of administration. Prop. Regs. Sec. 1.199A-5: It defines specified service trades or businesses and the trade or business of performing services as an employee. The regulations include an anti-abuse rule designed to prevent taxpayers from separating out parts of what otherwise would be an integrated SSTB, such as the administrative functions, in an attempt to qualify those separated parts for the Sec. 199A deduction. Prop. Regs. Sec. 1.199A-6: It contains special rules for RPEs, PTPs, trusts, and estates that these entities may need to follow for purposes of computing the entities’ or their owners’ Sec. 199A deductions. Prop. Regs. Sec. 1.643(f)-1: It addresses concerns regarding the abusive use of multiple trusts by confirming the applicability of Sec. 643(f), which permits the IRS to issue regulations to prevent taxpayers from establishing multiple non-grantor trusts or contributing additional capital to multiple existing non-grantor trusts in order to avoid federal income tax.